Heard of Cirque Magazine? 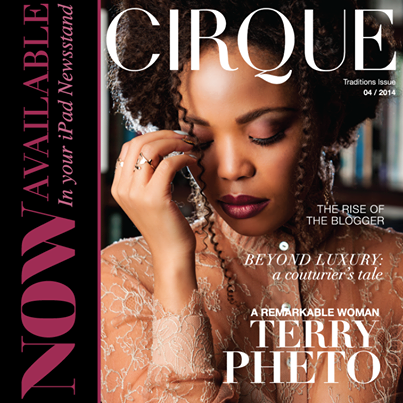 For those out the loop, Cirque is a high fashion monthly digital mag that focuses on designer wear and luxury living. I was very flattered when they asked to interview me as a ‘top blogger’ for a story on ‘the rise of the blogger’ and the blogging biz in general. Still, a few of their questions made me a bit nervy as their angle was a little ‘digital VS print’ and that’s a tricky subject for me as I work in both mediums. So, I’d just like to make it clear that while a lot of opinions are tossed around in the article, the only ones I’m willing to ‘attach’ myself to are my own. Also, I was asked (via e-mail) if I felt it was possible to make a living from a blog and said that it was via selling ads and advertorials. I didn’t mean to imply that I was doing that myself. I pay my bills via working as a freelance writer for various mags and online publications and have zero intention of turning my blog, which is my passion, into a ‘job’. Still, I do think that once advertisers realise blogs aren’t a dumping ground for all their crappy press releases and stop viewing them as a platform for ‘free press’ it might become a different story. But we’re not really there yet, alas. Anyway, to view Cirque’s April issue get clicky clicky over here. The entire mag downloads as a PDF and the blogger story starts on page 117. Alternatively, you can view the mag on your iPad via the iPad Newstand from the Apple App Store. Simply visit the App Store on your iPad, search for ‘Cirque Magazine’, install the app and enjoy. Hands up! Who wants to win a trip to Brazil to meet Ian Somerholder, Azzaro Pour Homme’s new face?